Take the Gil Hodges (Marine Park) Bridge, follow signs for Jacob Riis Park. Exit/veer left onto Beach Channel Drive. After approximately 1/2 mile, veer right just before the overpass and then turn right towards the Riis Park parking lot. Look for the toll booths for lot entry. Closest entrance from the lot to the Riis Park Beach Bazaar is at the far (west) end. Walk up the path towards the Bay 9 flagpole; concessions building will be on your left. the second light onto Rockaway Beach Boulevard. Take Rockaway Beach Blvd until it ends (149th St) and turns into the Riis Park traffic circle. Go around the circle veering to the left, then veer right towards the Riis Park Parking Lot. Look for the toll booths for lot entry. Closest entrance from the lot to the Riis Park Beach Bazaar is at the far (west) end. OvRride’s new charter buses feature plush, comfortable seating, air conditioning, on-board bathroom facilities and plenty of storage for beach chairs, bicycles, picnic baskets & surfboards! TRIPS FROM: all of NYC to all of Rockaway! Shuttles bring you from convenient stops in Brooklyn and Manhattan to Riis Park, and local shuttles run you from Riis to downtown Rockaway and back home. Runs from Riis til 9pm! Call Leroy for ANY transportation needs, from any borough – large groups too! Take the Rockaway NYC Ferry for just $2.75 from Sunset Park or Wall Street/Pier 11. 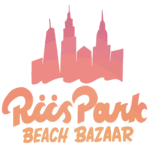 From there, a free shuttle will take you right to Jacob Riis Park where the Riis Park Beach Bazarre is located. Note: Take the shuttle heading West to get to the beach, and East to get back to the NYC ferry.